Take a ride on the finer side of life with GrabCar Premium or GrabCar Plus. Use the promo code UNLISTED* on the ride to accumulate your entries between 17 and 30 September, the top 3 riders with the highest number of entries will win a curated meal or fine dining vouchers at one of the restaurants under Unlisted Collection. *Promo code is for contest participation use, has no discount value. Contest runs from 17 to 30 September 2018. The contest is for selected users only. Promo code: UNLISTED must be entered for the booking to be eligible for the contest. Promo code has no discount value. 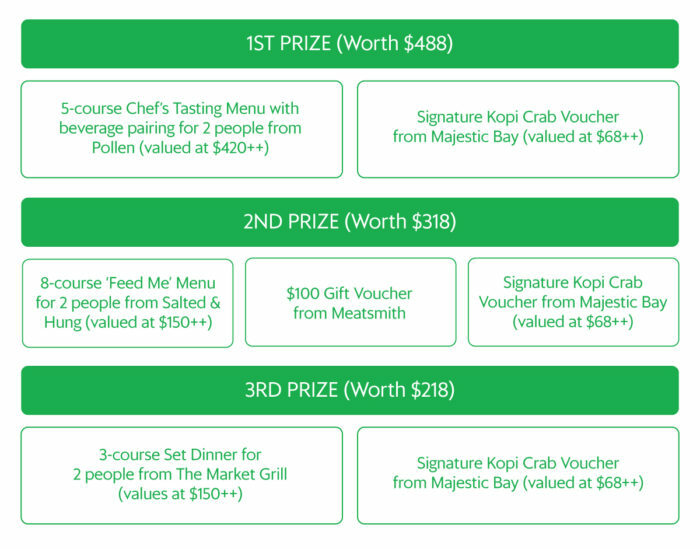 Each completed ride GrabCar Plus gives you 1 entry to the contest, GrabCar Premium gives you 2 entries to the contest. No limit on the number of rides, top 3 riders with the highest number of entries will win the prize, in the event of a tie, the faster of the users to achieve the highest number of rides will win. All winners will be notified by in-app push, inbox message and SMS before 7 October. In order to receive SMS, winners must be non-DNC registered. By taking part in the contest, you agree to share your contact information with Unlisted Collection in the event if you are the winner for prize redemption arrangement. Participation period is from 17 to 30 September 2018. Promo code is not exchangeable for cash or other forms of rewards.